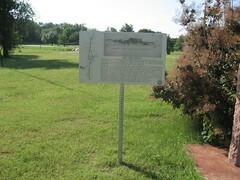 The Red Fork Trail ranch house stood about a half mile to the south of this location now marked by a granite monument on Red Fork Street. The image above was drawn by Adolph Hunnius in 1876 a surveyor (Courtesy of the Kansas State Historical Society). 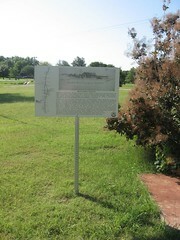 After the cattle trail became well established, trail ranches sprang up in various locations along the trail. Especially in Indian Territory. Here, the Trailing herds could stop and rest. The cattle could easily be contained in pens, and the drovers could enjoy basic amenities. The Red Fork Ranch is one of the best known and documented of these ranches. During the height of the trail season, tens of thousands of cattle could be found bedded down nearby, in addition to the drovers. Travelers along the military road: stage coach passengers, teamsters driving heavy freight wagons, army patrols, and Indians. Generally, the cattle road ran along the east side of the ranch, with the military and stage road along the west.